I need to call our case worker to double-check but I believe all of our requirements to reopen our home as foster parents are now met. BIG SIGH! We really loved our last house but sold it so we’d have room for our family to grow. Specifically, we wanted to have more bedrooms so we could continue to provide a home for children in foster care. 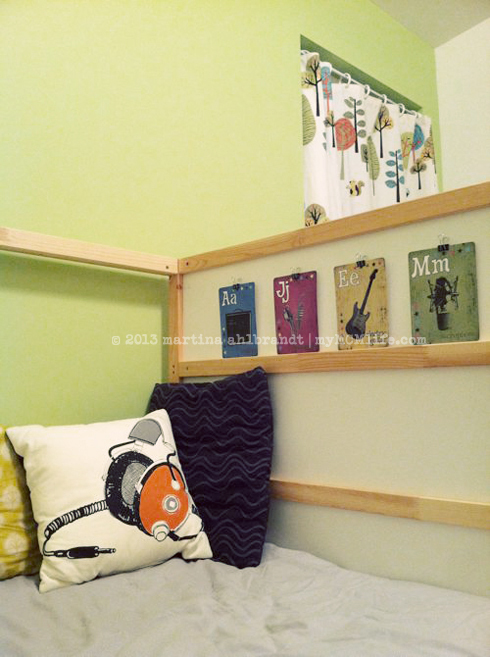 At our previous home, I designed a room that could suit one or two kids ages birth to five years old, male or female. 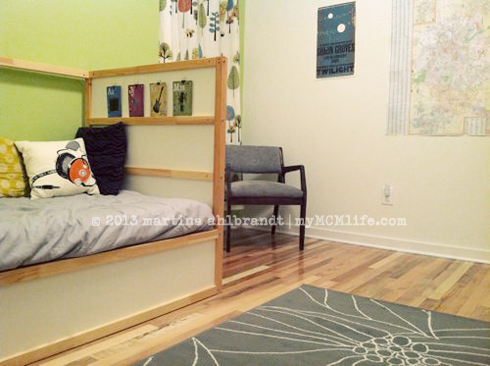 It was a big challenge, especially with a small room. This room is targeted toward 2-12 year olds in my mind, though we’re keeping an open mind about ages at this point. 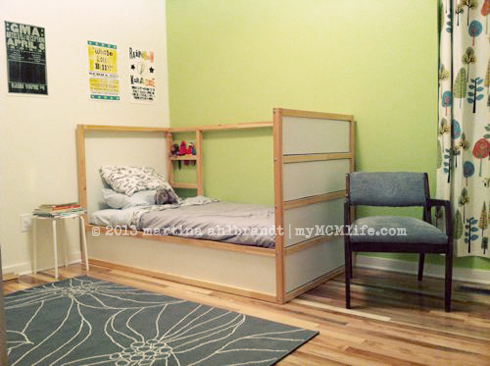 It felt much easier this time around, I suppose because we already had the super versatile IKEA KURA bed (which can be flipped over to be a low loft bunk bed) and I’m not set on putting a crib and dresser in here…yet. 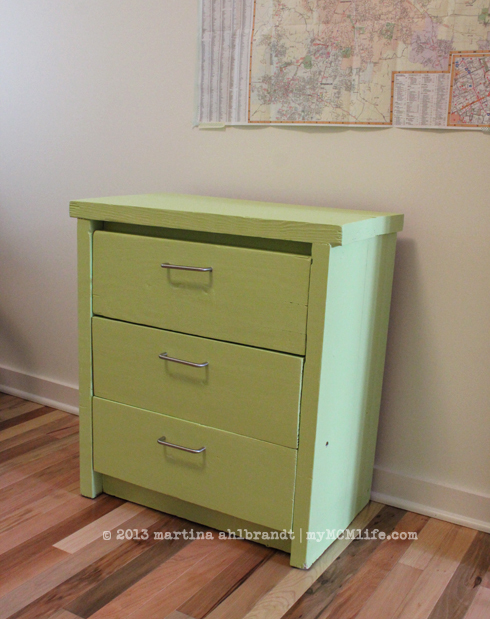 (We do need to add a dresser ASAP, we found out last week.) Other than the bed and bedding, the woodland creatures curtain was the only other element we started with from the previous house. I chose the green wall color based on the curtain. Also, green is supposed to be soothing and it’s one of my favorites. I read somewhere that mirrors are good for self esteem for kids. Ali loves looking in the full length mirror in her room so I put one in this room, too. It was less than $10 at Target. See that house reflected in the mirror? I found this when we were unpacking. I colored this picture in art class in first or second grade. I pray that our next kids will feel at home in this room and at our home. I added some cuddle buddies to the bed. This old acoustic guitar that was a gift from my parents for my 16th birthday narrowly escaped the trash during the move. (Jason’s guitars are a million times nicer so he doesn’t see this as fit to play. However, I think some tween or teen might love it!) We also have a collection of random, discount pile Hatch Show Print posters that I thought could help fill the walls here. There are a few vintage ReAbide items living in here. 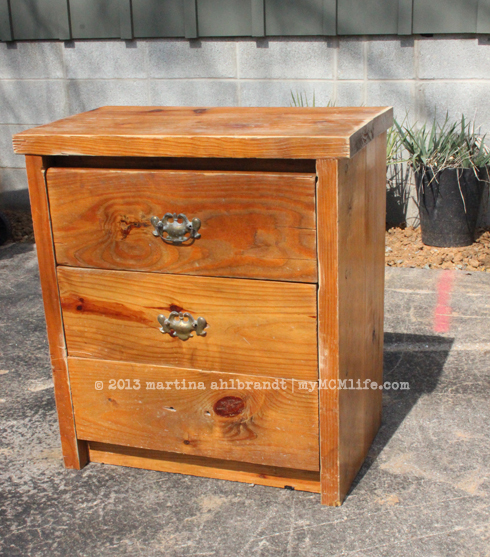 This Florence side table works for now as a night stand. 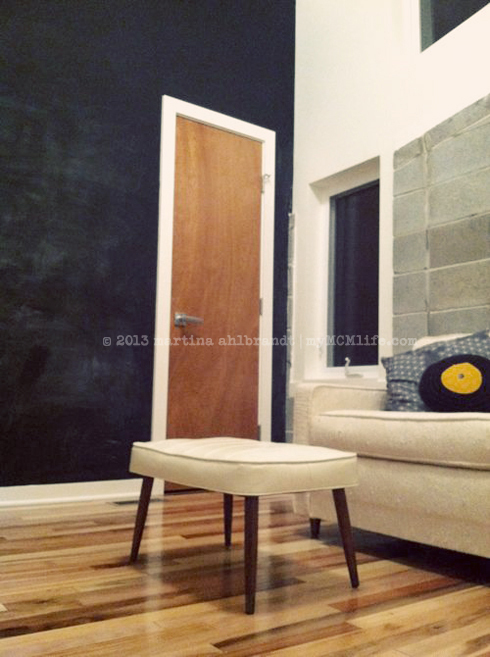 And this Mack arm chair (below). Before we moved in, I ordered a Nashville road map. I thought it might work as a big poster for this room. 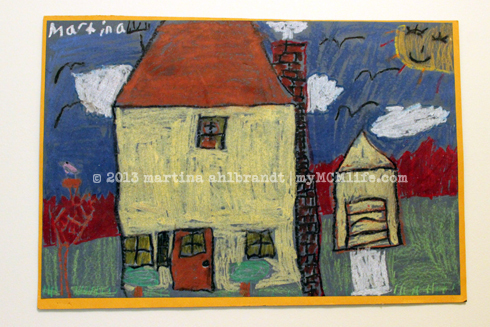 It’s colorful and free (as an AAA member) and I thought it might be neat for kids to see where our house is in comparison to where they used to live. 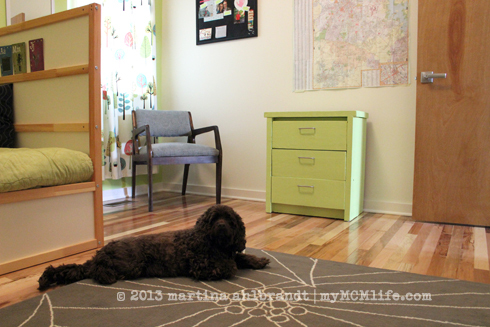 The rug is from a local IKEA reseller. I think it’s the only thing besides the full length mirror that we purchased for this room. 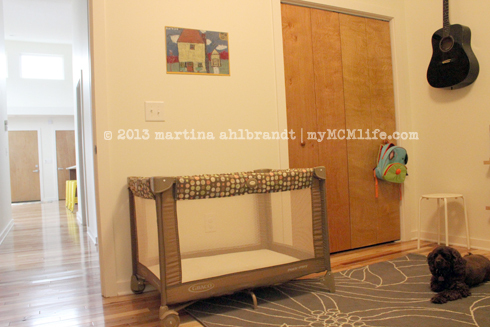 I have a pack and play set up in here. I’m hoping it’ll be enough to convince our case worker that we’re equipped to take a child younger than two. 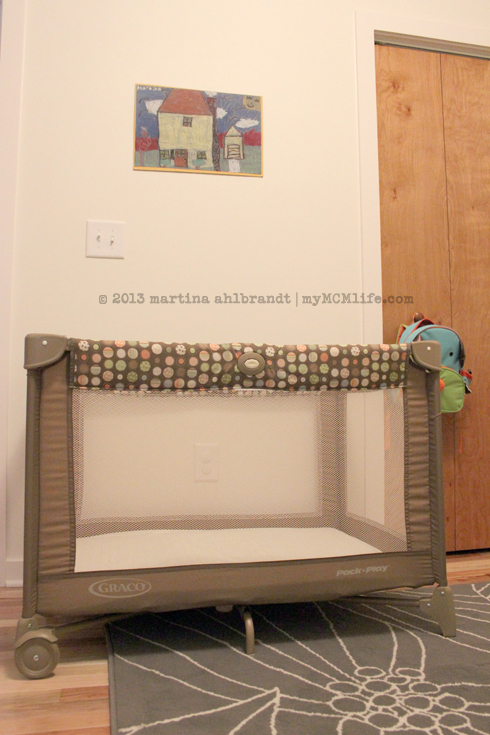 Ali still sleeps in her crib and I don’t have much desire to buy and set up a second crib. If we accept a placement of a younger child, we might consider getting another one at that point…or maybe moving her to a big kid bed. 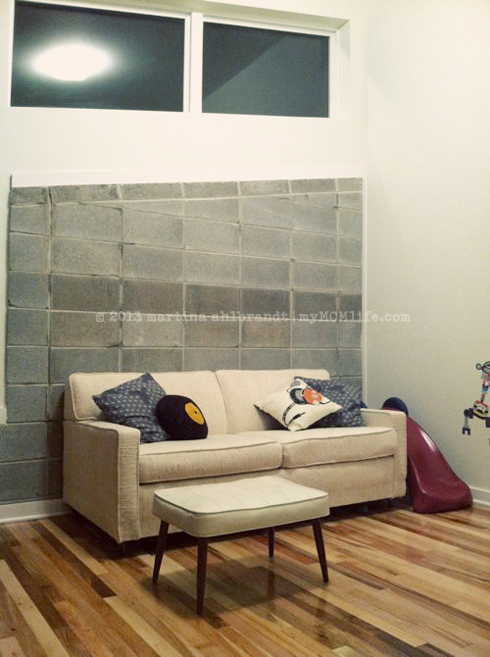 The book ledges also came from the previous house. These books (with the exception of Pop Warhol’s Top…which I don’t recommend) these books were are all specifically chosen to be in this room. So a really cool thing happened. 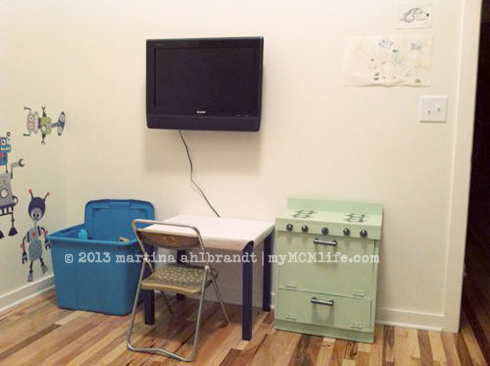 This room developed a theme without me even realizing it! 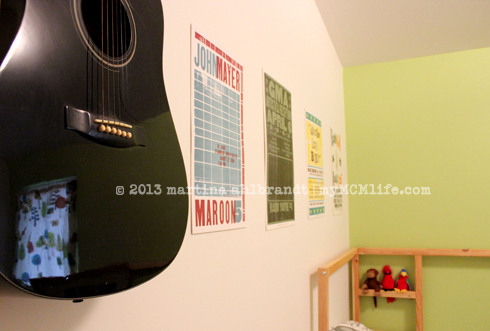 I suppose it started with the Nashville map, and then the Hatch Show Print posters, and then the guitar. The headphones pillow and the rockstar flashcards followed suit. The theme that developed—which happens to be something that every child who stays in this room, regardless of age or gender will have in common—is Nashville! Music City. Even the woodland curtains and botanical bedding and rug work. We live very close to a huge park so we see squirrels, owls , leaves and lots of trees in our neighborhood. 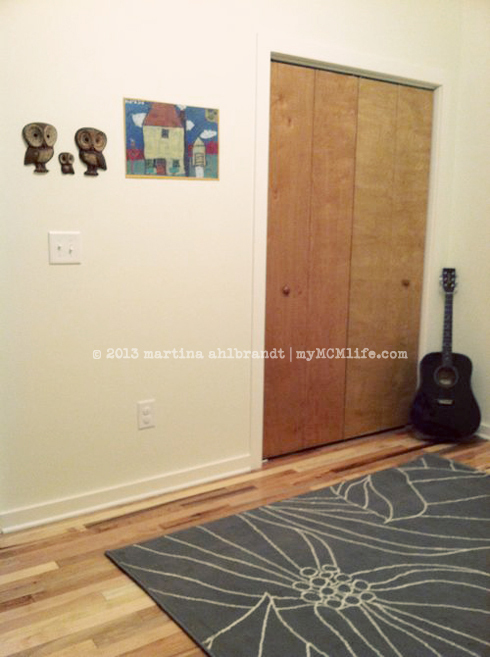 It was important to me that I had thoughtful, personal elements worked into the design of this room. 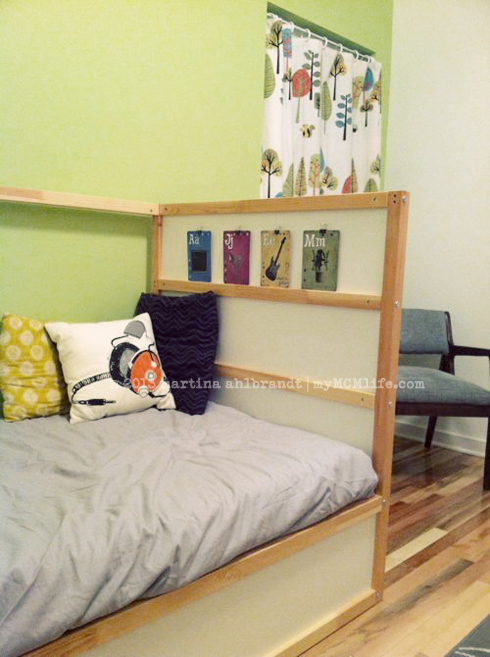 I didn’t want it to feel like a guest room. I want it to be a special room because it’s made for a really special kid…a kid we don’t know yet but I want him or her to feel comfortable, loved and wanted from the moment they walk in. I want him or her to know that we’ve been thinking about and praying for him or her before we ever met. 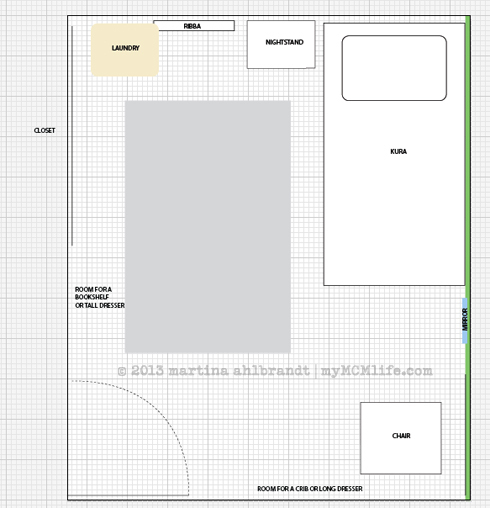 Here’s the floor plan of this room. It’s about 10×12. 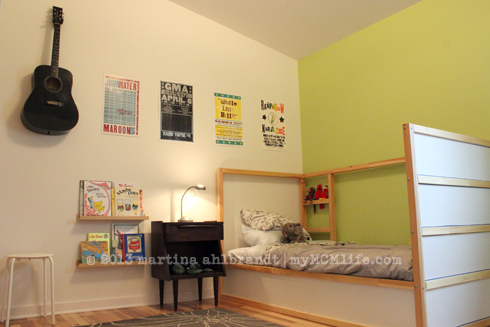 We have this room set up with a twin bed and a pack and play. 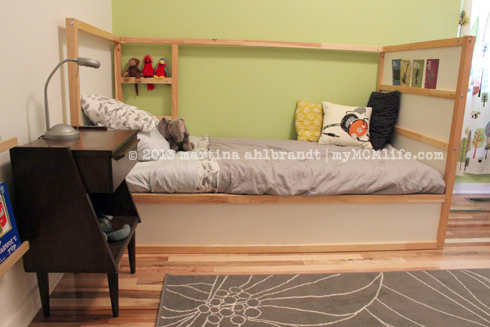 Without much trouble at all we could flip the twin bed into a bunk bed and replace the pack and play with a real crib. 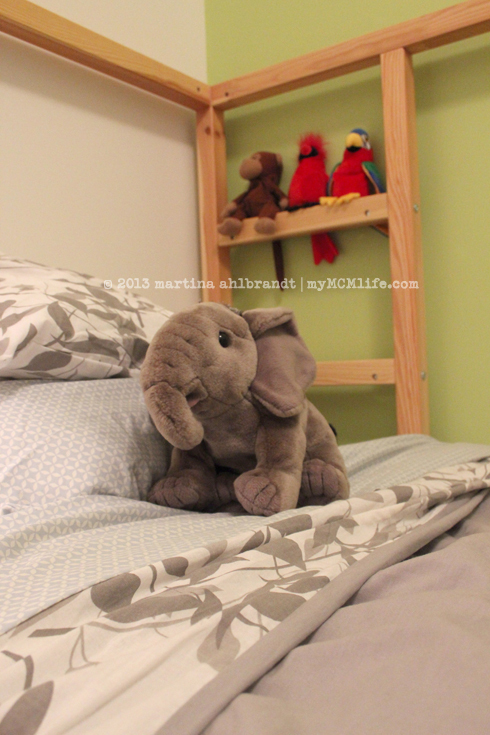 Sometimes foster parents put together a really nice room for 5-12 year old kids and then God has a sense of humor and their first placement is a newborn. Flexibility is key for foster parents. This is one of our home checklist requirements from DCS. I’m hoping to add a dresser before too long but for now, we have a big closet ready with hangers and hanging storage for smaller items. We also keep extra blankets, pillows and sheets in the closet. Admittedly, we don’t have toys in here but we do have a playroom right down the hall. It’s mainly because of the wide age range this room is open to that I haven’t put many toys in here. 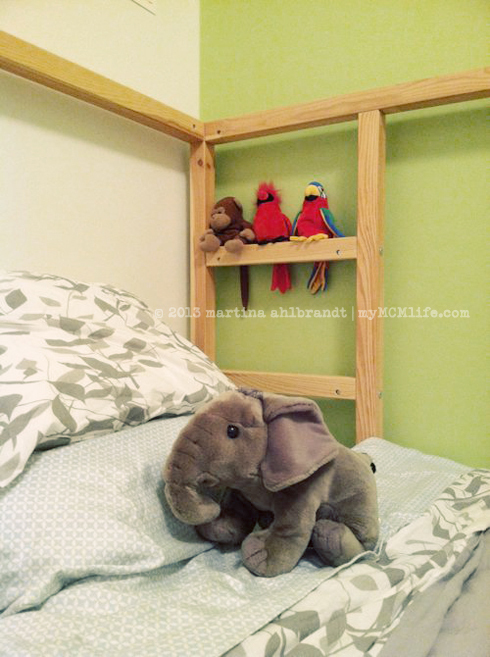 The stuffed animals are probably nice for any age kid, though. 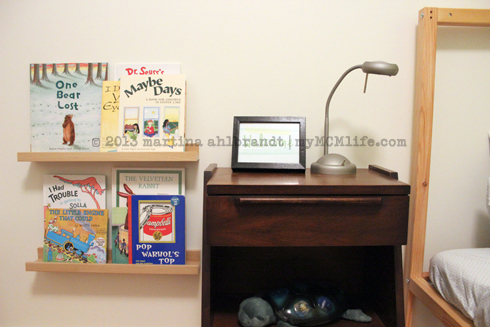 These books have been carefully selected to be in this room: Maybe Days: A Book for Children in Foster Care, I Don’t Have Your Eyes, I Had Trouble Getting to Solla Sollew, The Little Train That Could, The Velveteen Rabbit, and the Sleep Book. Some kids won’t want it on but we have it ready just in case. A new room can be scary and dark. The nightlight is enough to make the whole room visible. We also moved Ali’s constellation turtle light in here because she doesn’t use it anymore. It projects stars on the ceiling for 45 minutes before shutting off automatically. We’re also required to have hallways lit and to have flashlights handy. We got this 3-in-1 night light, emergency light (comes on automatically when the power goes out) and flashlight for our first foster parenting experience. It is in our hallway. 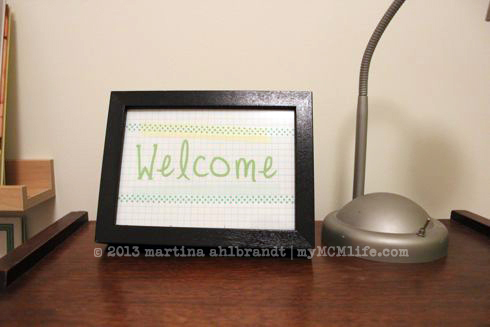 The frame on the nightstand that says “Welcome” is actually a placeholder for a personal photo. Thanks for another foster mom’s suggestion, I also added (after taking photos) a bulletin board with pictures of “Who Lives Here” (me, Jason and Ali with names by our photos) and a photo of our first foster placement with her name and hand print. I will add a photo of each new child under either category. Another requirement for our home safety checklist—not that we have a curtain but that there are no choking hazards dangling from blinds or curtains. Yeah, I actually stuck this rug to the floor with rug tape. Another item on our home safety checklist. Our list doesn’t require it to be in the child’s bedroom but there is one in there per codes for a new house build. Also per codes, in order to be considered a bedroom, a room must have a window that can be opened for escape in case of a fire. Our home safety checklist also requires this. 75% is enough for now. Enough to call our case worker to have her come out and do a walk-through. Enough to make me feel mostly prepared. 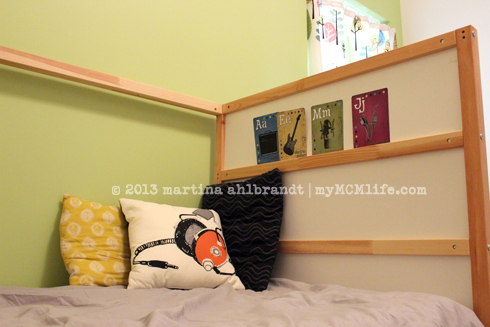 At our last house, I designed a combined nursery and kids room as we were becoming foster parents. 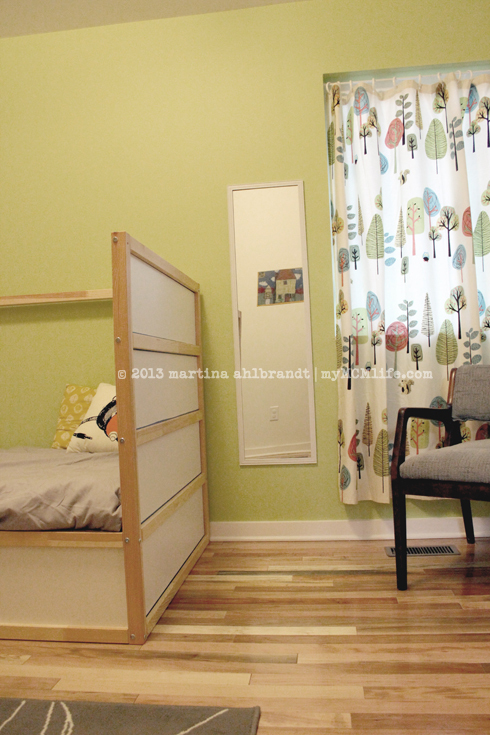 It had to be suited for 1 or 2 kids, either gender, newborn up to age 5…all within a 10×11 bedroom. 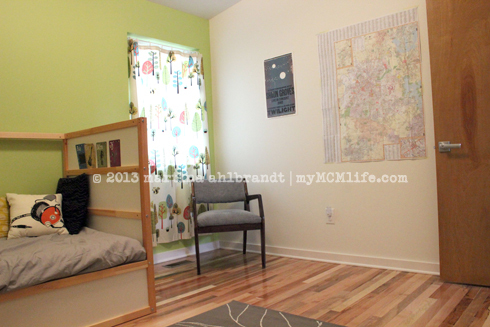 In our new house, we’ll have a nursery for Precious and another bedroom that’s set up for our future foster kids. I’m not really sure what parameters we’ll set next time around so I’m planning this room for 1 or 2 kids, boys or girls, ages 2-12. The room is approximately 10×12. We already own the bed, dresser, curtain, book ledges, owl, sheets and chair. The rest would be new purchases.